ABC's Oscars live stream problems: Cuts to Jeopardy, The Social Network. 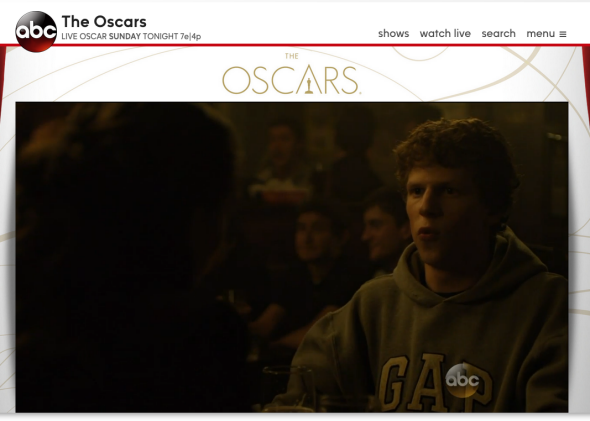 At least twice in the course of the Oscars, ABC accidentally switched online viewers to The Social Network and other unrelated programming. Sunday’s Oscar ceremony featured two historic moments. One was Poland’s first Oscar: Ida, the black-and-white movie about a nun traveling through ’60s Europe, won for Best Foreign Language Film. The second came when Pawel Pawlikowski, the movie’s dapper director, took the stage to accept the award. Pawlikowski launched into a seemingly never-ending stream of thank-yous, prompting the inevitable swell of play-off music. The director sped up his speech but kept on going, and then … the music stopped. That’s right: Pawel Pawlikowski, hero of our times, went up against the music that dispensed hundreds of directors, actors, and producers before him, and won. The audience erupted in cheers, and several later awardees, inspired by his example, fought the music as well. Welcome to 2015, when everyone’s afraid of superintelligent machines taking over the world and no one can run a half-decent live stream. Last month, NBC streamed the Super Bowl for free to anyone who wanted to watch. The execution was pretty terrible. But at least it was a noble effort. On Sunday night, ABC streamed the Oscars—but only to people who were already paying for cable, and only if they happened to live in one of the eight U.S. cities in which ABC owns and operates a local station. Somehow, despite the tightly restricted audience, ABC’s execution was even worse. Multiple times during the online broadcast, viewers were booted without warning from the Oscars to unrelated ABC programming. On the East Coast, I found myself suddenly watching the opening scenes of the 2010 David Fincher movie The Social Network. Friends on the West Coast reported that they were abruptly transported to Jeopardy. This happened both to people watching on the Web at abc.go.com and to those watching on mobile devices via the Watch ABC app. In short, ABC accidentally changed the channel on its online audience at least twice. It took several minutes for the feed to revert to the Oscars telecast, although you could get there a little faster by refreshing the feed (and re-selecting your cable provider). Either way, there was a good chance you missed an award or performance while Alex Trebek or Jesse Eisenberg were talking. When Sean Penn took the stage to present the award for Best Picture, I half-expected ABC to cut over to Heidi. All of this, mind you, was on top of the slowness that typically mars network live feeds of big events. The lag on my Oscars feed wasn’t as bad as it was for the Super Bowl, but it was long enough to allow Twitter to tell me who won each award before the presenters did. On second thought, maybe I would have been better off just sticking with The Social Network. Again, live-streaming events to a mass audience isn’t easy. But it can’t be as impossible as the recent efforts of ABC, NBC, Microsoft, and Apple would lead us to believe. Just look at Major League Baseball, which routinely live-streams games on MLB.tv without a hitch. ABC’s own corporate sibling, ESPN, streams sporting events every night of the week on WatchESPN without ever (in my experience) randomly booting its audience over to First Take or Around the Horn. What gives, ABC?